The 311 FL-X has about 30% more flex compared to the SQlab 3OX handlebar, which reduces fatiguing vibrations and absorbs peaks of bigger hits. The 16° backsweep with its short reach provides a natural transition from the lower arm to the hand when in a more stretched riding position. 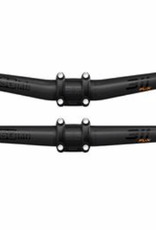 The 4° upsweep brings the elbows into a perfect position for a dynamic riding style. The 15mm or 30mm rise allow individualized positions.